[188 Pages Report] The market for industrial labels is estimated to grow from USD 43.04 Billion in 2016 to reach USD 55.95 Billion by 2021, at a CAGR of 5.39%. The base year considered for the study is 2015 and the market size is projected from 2016 to 2021. The segments considered for this report are based on type, material, end-use industry, mechanism, printing technology, identification technology, and region. The global industrial labels ecosystem comprises industrial label manufacturers, vendors, and service providers. The value chain of the industrial label market includes printing machinery manufactures such as HP Inc. (U.S.), Cannon Inc. (U.S.), Xerox Corporation (U.S.), Cenveo, Inc. (U.S.), and many more. The labels manufacturers include CCL Industries, Inc. (Canada), H.B. Fuller Co. (U.S.), Cenveo, Inc. (U.S.), Dunmore Corporation (U.S.), 3M Company (U.S.), Brady Corporation (U.S.), Avery Dennison Corporation (U.S.), DuPont (U.S.), and Henkel Ag & Company (Germany). Additionally, the products are used in construction, automotive, consumer durables, and logistics & transportation industries on a global scale. This research report segments industrial labels into the following submarkets. 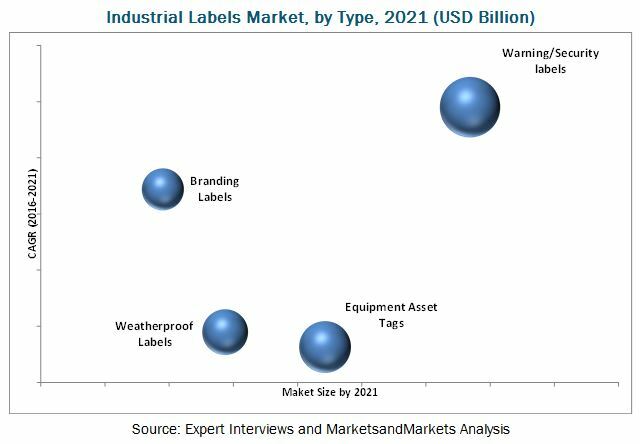 MarketsandMarkets projects that the industrial labels market will grow from USD 43.04 Billion in 2016 to USD 55.95 Billion by 2021, at an estimated CAGR of 5.39%. The market is growing due to growth in end-use industries such as construction, aerospace & defense, automotive, consumer durables, transportation & logistics, and many more. Along with the same, rise in demand of sustainable & recyclable labeling & packaging material has fueled the market for industrial labels. Emerging economies such as India, South Africa, Brazil, and oil-centric GCC (Gulf Cooperation Countries) possess a great potential for the industrial label market. This market is segmented on the basis of type, end-use industry, material, printing technology, mechanism, identification technology, and region. In terms of type, warning/security labels held the largest market share, in terms of value. It is projected to grow at the highest CAGR. The excellent growth is witnessed because of the increasing demand of these labels in industries such as construction, automotive, consumer durables, and transportation & logistics. In terms of material, the polymer material segment accounted for the largest share in this market, in terms of both value and volume, among material types. However, the metal material labels segment is projected to grow at a significant rate. The demand for metal labeling propelled because of a variety of reasons such as durability, cost effectiveness, and easy installation. In terms of end-use industry, the market is segmented into transportation & logistics, construction, automotive, consumer durables, and others. The transportation & logistics segment is projected to grow at the highest rate due to the increasing trends in the supply chain & warehousing industry and online shopping ability of consumers. In terms of region, the market for industrial labels is segmented into North America, Europe, Asia-Pacific, and Rest of the World. The Asia-Pacific region is projected to grow at the highest CAGR among all the regions by 2021. This is mainly due to emerging economies in China, Southeast countries and India; urbanization; industrialization; and excellent PEST (political, economic, social, and technological) conditions. The laser engraving labels segment in the industrial labels market has high growth as these are applicable on almost any type of materials such a platinum, silver, brass, gold, stainless steel, carbide, copper, titanium, and plastics with a variety of advantages. The strategies such as mergers & acquisitions and agreements & expansions were majorly adopted by most of the players in this market. Companies such as H.B. Fuller (U.S.), Henkel Ag & Co. KGaA (Germany), CCL Industries Inc. (Canada), and Fuji Seal International, Inc. (Japan) were the key players who adopted these strategies to increase the reach of their offerings, improve their production capacity, and establish focus on core operations. Companies also emphasized on new product launches to increase their product portfolio in the fast-growing regions. Companies such as Brady Corporation (U.S.) and DUNMORE (U.S.) have adopted this strategy. These players also have a strong distribution network and influencing presence in the developed as well as developing economies. 14.10 Fuji Seal International, Inc. Figure 47 SWOT Analysis: CCL Industries Inc.